Students at Rock My House Music Centre are required to commit to a monthly schedule consisting of 1 half hour lesson each week. A monthly committal of 4 or 5 prepaid lessons either by cheque/debit/credit or cash will be accepted. Lessons are $25/half hour. New students can try one lesson before committing to a longer term. If registering in the middle of the month, the student can pay the remainder of the months' lessons. Continued lessons are to be renewed and paid for on the last lesson of the current month. This maintains and secures your allotted time slot with the instructor. 24 hour notice is required for any cancellation of a scheduled lesson. Make up sessions will only be granted for missed lessons that were prepaid and cancelled with more than 24 hours notice upon the availability of the instructor. A missed lesson or a "no show" under 24 hours will result in the loss of that lesson. We apologize for this but our teachers still need to be paid. They are all worth it! Keeping in mind that our Vicinity Program allows you to collect points for free lessons. We think this is a very fair compromise, hopefully you do too. Rock My House Music Centre may be required to cancel a lesson session for extenuating circumstances ie: power outage, weather conditions, or instructor illness. This will be advised to you via phone, and or email. We will honor your paid session and reschedule it to a later date. If a lesson can not be made up in a timely matter then It will be taken off the following months fees. 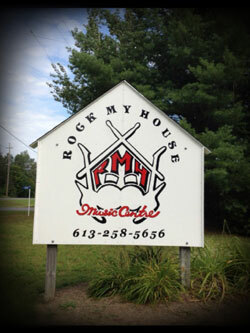 Thank you kindly and enjoy your time at Rock My House!